OTT players use predictive analysis and AI-based technologies to evaluate consumer behaviour. It enables them to create personalized OTT solutions that are projected as the future of content delivery. With the introduction of mobile content delivery Traditional broadcast TV has lost its identity. A study conducted by Juniper Research shows that global streaming subscriptions will reach 333.2 million by 2019. Oodles Technologies sets the benchmark in creating dynamic and user-friendly online video content platform. Our advanced video solutions help businesses organize and manage their online video content efficiently. Over the Top players are using technologies that can reveal consumer psyche. Video streaming platforms enable clients to anticipate demand and customize offerings so that popular content can maximize business revenue. Various studies have shown that a significant proportion of consumers prefer regional content. Changing consumer viewing preferences have led to a significant reduction in traditional cable service providers. Earlier, the delivery of video content was provider-driven, but with OTT platforms is now consumer-driven. Viewers prefer flexible and convenient content delivery platforms. OTT platforms fulfill these consumer preferences to provide whenever and wherever access to rich media. The demand for OTT platforms will continue to rise with an ever-growing volume of content and limited viewing time. We offer native set-top box solutions that are fast, intuitive, and engaging. Our OTT experts develop high quality, robust apps for multiple VOD and OTT platforms including Amazon Fire Fire TV stick TV, Roku, Apple TV, Samsung TV, Vewd TV, webOS SDK, Foxxum OTT, Google Chromecast and more. Oodles Technologies specializes in creating feature loaded Smart TV applications using SDK technology. Our developers build user-centric smart TV apps for clients which enable them to showcase their brand and market their products with ease. We have expertise in developing Smart TV apps for Samsung Native, Tizen, Opera, and others. We integrate WebRTC in business-specific web applications to enable our customers to position their brands through scalable WebRTC application development. We facilitate peer-to-peer communication across mobile devices and web for client projects, employees, or standalone users. Our solutions include real-time text chat, screen sharing, audio-video communication, data exchange, live streaming, tracking, recording, and more. Current trends indicate that OTT platforms will continue to rule the entertainment industry. 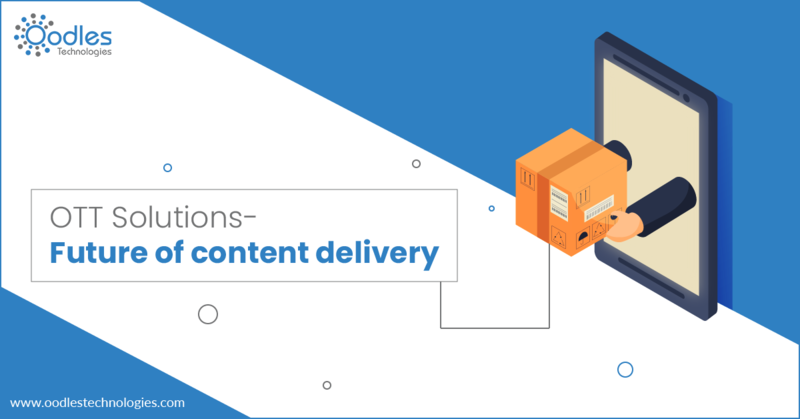 Top platforms content providers like Netflix, Amazon, Hulu, and Apple distribute content through their OTT platforms. They are catering to consumers’ on-demand viewing preferences and changing the future of content delivery. Are you planning to avail an OTT platform for your media business? Get in touch with software development experts at Oodles Technologies. We help you provide Digital video solutions that help you transform your business operations. Our OTT platforms are designed with consumer research to maximize your ROI. Contact our experts now!